Nicolas Delmotte (FRA) and Ilex VP. Crédit photo: Pixels events. One more time, the public of Dinard, evaluated at 18 500 persons, was present, and had filled up the stands of the Val Porée stadium to encourage with enthusiasm some of the best riders in the world. 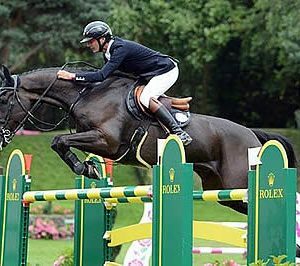 This edition 2017 goes to the French Nicolas Delmotte, riding his nine year old stallion, Ilex VP, a son of Diamant de Semilly. 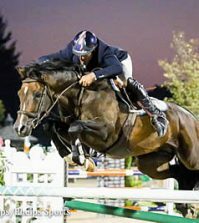 Out of the 33 pairs on the start list for this 1,60m class designed by the international course designer Jean François Morand, only two cleared the course, and were called to ride the final phase against the clock. 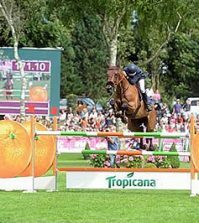 The final phase against the clock was run according to a very unusual scenario, since Nicolas Delmotte clears the course, in a time that he considered himself « beatable » but the Egyptian, after a pole down on the first fence, decided to retire and has to do with the second position. 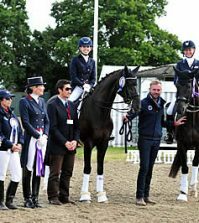 The French rider, based in Douai, in North of France, thanked the Mars family for its organization, and the owners of this very promising stallion (who was competing in its first CSI5*), Beatrice Martens and Véronique Daems Vastapane. If he found the course rather delicate, Nicolas paid tribute to the course designer not asking unnecessary efforts to the horses. Karim Elzogby, very fair play, said he was very happy to be back in this stadium he knows very well since he worked in Brittany for 20 years. 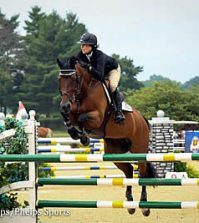 He promised to be back if his only horse, Amélia, is still in good shape next year. Thanks to the hard work put in by the Mars family, in charge of the site since 2013, and the 120 officials and volunteers, this International Jumping of Dinard has one more time kept all its promises, with a prestigious list of riders, and an outstanding organization.